Boarding starts at 15:30 from Fethiye Harbor. The harbor town Fethiye is located at bay surrounded by pine forests in the Gulf of Fethiye. With its sheltered harbor for yachts, colorful bazaars, numerous beautiful beaches and bays rich coastline, gorgeous, partly uninhabited islands, Fethiye for a long time a famous tourist destination. Fethiye is located on the site of the ancient legendary city Telmesa. Earlier this place was dedicated to Apollo. To IV century BC the city had close economic relations with the Greek island Rhodes , and after the IV century it was included by the Romans in the Lycian state. In the VIII century BC Telmes was renamed Anastasiopolis and in the IX century BC Macri was named. Only in 1914 the city got its real name Fethiye – in honor of a military pilot Fethi Bey, who died in the line of duty. The main advantage of this resort – a calm sea . 5 km to the northeast of Fethiye are wide Calis beach 8.5 km to the south is the famous Oludeniz beach – &quot; Blue Lagoon &quot;, which is famous for its picturesque scenery. Both beaches offer tourists a wide range of restaurants. From land Fethiye is protected by mountains covered with pine trees . That`s why there are so popular paragliding – paraglider slow descent from the mountain Babadag seaward. In Fethiye you can devote time to the classical relaxation: swimming in the sea , sunbathing on the beaches – or plunge into the nightlife. Also here you can go diving , visit the spa , bars, cafes, restaurants and so on. Our trip is starting from one of the one of that beautiful places in the world where ancient is adjacent to the civilization, the sea to the mountains, with the slow pace of temperament. Rhodes Island has extensive excursion programs. During the walk, you will visit the main sights of the city of Rhodes Palace of the Grand Masters, an ancient hospital, numerous residences, and street knights. Also, it is necessary to visit the hill of Monte Smith, with a breathtaking view of the old and the new cities, the ruins of the temple of Apollo, the ancient stadium and theater. The island is really rich about magnificent beaches located on the east coast of Rhodes. The long sandy beach Tsambika is 26 km southeast of the island’s capital. Everyone can take part in water sports. Very close to beach nearby monastery of Panagia Tsambika and a small church are located here. There are legends that this place helps to people who want to have a child or family. Agate Beach is located on the other side of a small hill in the east. Golden sand and shallow waters make this beach ideal for those who would like to take vacation with children. To get the Acropolis you can either walk or ride a donkey. The road to the Acropolis is very picturesque. You will meet stone fountains that still supplied with water by means of ancient aqueducts, past the white square houses with sky-blue shutters and gates. You will walk throughout the gardens, laden with pots and sweet taverns with magnificent flavors. Lindos Beach is so beautiful while you are standing on top of Acropolis. Therefore, if you come to see the Acropolis you should also get acquainted with the beach. Gorgeous golden sand and all the necessary infrastructure for a rest at your disposal. And if you decided to stay for dinner at one of the local taverns, it`s majestic place for to spend evening here after sunset. Acropolis decorated with special illumination. The main settlement of the island was small village Symi. Symi houses are painted with different colors. This fact made this place fantastically beautiful. It is possible to see ruins of fortress of knights, which was constructed on the Acropolis place. In addition, on the top of mountain, the church of the Virgin Mary and fortress are located. If you will have the opportunity, you can visit a museum and an operating monastery Panormitis with magnificent wall painting. Bozburun are famous like a ship workshops. Very popular wooden yachts had been made here. During walk on hills, it is possible to meet the remains of the ancient city of Larumna. Bozburun has become a central attraction, visited by tourists from all across the world. We will cruise to Selimiye Bay for lunch. Here were found the remains of 11th century ships that are exhibited in the museum of Bodrum. In the ancient city Bozukkale (Loryma) is a castle, which is a quadrangle with the city walls and 9 temples. Name Bozukkale means Crooked Castle and may be associated with the fact that one wall of the castle is destroyed. Due to its location and narrow entrance to the port, it is also used by the Greek forces during the Peloponnesian naval battle. Karor leader of the Athenians gathered all his ships here before kunidusskoy war in 395 BC. The port is used for the preparation of the attack on Rhodes in 305 BC. Heading to Ekincik. This bay is famous about big blue crabs. Later we will visit one of the most beautiful beaches of the world Istuzu beach. Here you can sunbathe and swim in the river delta of Dalyan on the long sandy beach (natural reserve area of Turkey). After lunch on the boat, you can sail with the wind through the reeds to the ancient city with its Lycia exotic settlement and a trip to the lake along Kogcegiz with diameters 65 sq. km. You can discover the old Turkey, observe internationally famous Caretta Caretta turtles, whose ancestors came from the water to the land 95 million years ago. While traveling by boat on Dalyan, you can see , the Lycian tombs of kings IV, city of Caunos, Roman baths, a church and an amphitheater. Second stop yacht awaits us in this day of healing and rejuvenating skin diseases for lifestyle sources. Natural pool filled with sulfurous water and the bottom is covered with healing mud. Another Harbor is a ten minute walk from the shores of the bay. Here, presumably, was located the ancient Delphic Thelandira leagues – the Union of Cities (5 miles). During the Byzantine Empire was built on the island Navy Yard, later expanding and strengthening the Ottoman Turks. Ruins shipyards are still visible. The eastern part of the bay is especially convenient for parking, so it is relatively shallow and protected from the wind. Tersane one of the few surviving monuments of his era. 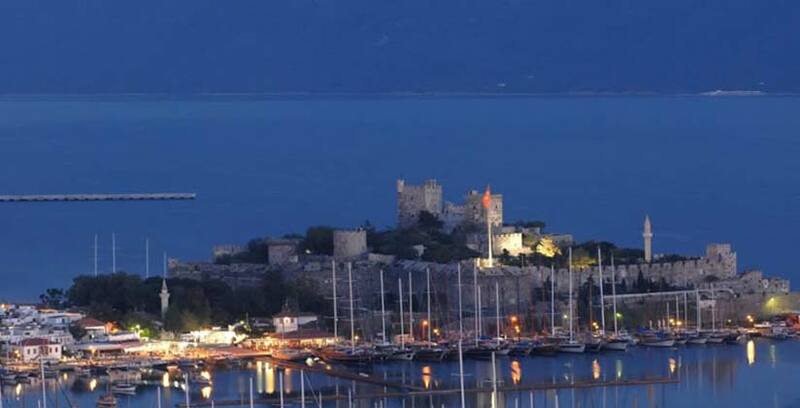 Then out gulet will cruise to Aga Harbor for dinner and overnight stay. You will really surprised when you will see ancient ruins of Hamam Bay! The region is known as a Cleopatra’s Bath, or Sunken Bath Bay coastal tectonics, such as the formation of the bay in the Gulf with many bays. A careful examination of the hill slope behind the bay, which is active in the past, this hill is a crater lake of tectonic structure and reducing water channels, clearly visible from the shore. The monastery dark, pine trees and up the hill from the shore in some places covered with carob trees. Structure of an ancient wall running parallel to the direction of the north-east coast and other small remnants of ancient Lyciare minds me that you are not far from the city. Lydia Network Port can be reached by a hiking trail approximately 1.5 hours. After breakfast we will visit one more magic place Domuz Island. Name of Domuz came from story about wild boars lived on this island. This is a magnificent place for diving ! You can see ancient ruins underwater. At sunset, the sun hits the stones and turns crimson red in color, a color that resembles the island soil. The island got its name from this phenomenon. There is very little infrastructure on this island. The southern tip of the island has a lighthouse that guides maritime traffic. To the north-west are the Deliktas Islands, ideal for diving and fishing. The red waves off the east coast of the island wash the wide sand beach and are best suited for swimming. Then we will cruise to Arap Island for dinner and overnight stay. You will leave the gullet with precious memories by 10:30. Antalya, Turkey’s principal holiday resort in the Mediterranean region (ancient Pamphylia), is an attractive city with shady palm-lined boulevards, a prize-winning marina on the Mediterranean. In the picturesque old quarter, Kaleici, narrow winding streets and old wooden houses abut the ancient city walls. Lately, many foreigners have bought (and continue to buy) property in and around Antalya for their holidays or for the retirement. It became a popular area especially for the German and Russian nationals. During the winter months its population is around 2 million, but in the summer times it doubles. The region around Antalya offers sights of astonishing natural beauty as well as awesome historical remains. You can walk behind the cascade, a thrilling experience, at the Upper Düden Waterfalls, 14 km northeast of Antalya. On the way to Lara Beach, the Lower Düden Waterfalls plunge straight into the sea. The nearby rest area offers an excellent view of the falls; the view is even more spectacular from the sea. Kursunlu Waterfalls and Nilüfer Lake, both 18 km from Antalya are two more places of superb natural beauty.